In part three of John Riley’s beginners guide to digital photography he shows us how to crop and resize images in Photoshop. The Crop Tool offers a fast and easy alternative. This example is for web at 1000 pixels wide and 72ppi. to look at some simple ways to process and improve our images. The most basic darkroom technique is image cropping either to remove unwanted elements or to modify the composition. This can also be achieved with transparency film using masks or with prints by using a trimmer. The principle is the same. 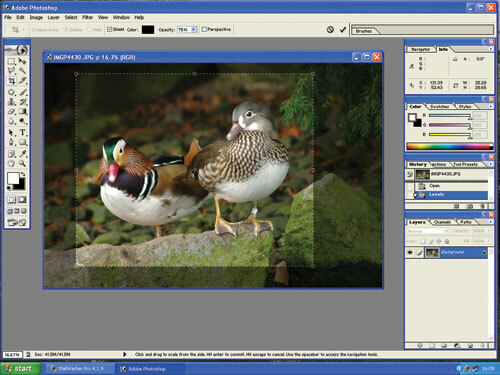 Digitally, in Photoshop, there are two approaches, via the Crop tool, located in the tools palette to the left of the workspace, and via the Image Size dialog box found under Image>Image Size. I use both methods depending upon circumstances. Firstly, taking a new image, I will want to produce a master copy from the original camera file. This copy will have all the adjustments such as levels and/or curves applied plus any other digital manipulation. The two final steps in the process will be resizing and sharpening, but for now the master copy will be saved in an unsharpened state. The size will be the largest size I will ever want to use, which is around A3. Image Size Dialog In the Image Size dialog “constrain proportions” and “resample image” will be ticked by default and should stay so for this purpose. Simply enter the size required, for A3 – 42cm wide – and check that the vertical height does not exceed the 29.7cm height of the paper. If it does, select a height of 29.7cm instead and the width will reduce accordingly. As we may be printing we should ensure that the resolution is entered as 300ppi (pixels per inch). The resulting image will now fit on an A3 sheet. This is saved, either as a lossless TIFF or as a quality 12 JPEG, as you wish. Quality is now so good that I no longer save as a TIFF, but the choice is there. For users of Photoshop CS2 or newer, there is a choice of resampling methods and you can opt for the standard Bicubic, which does a fine job, or for Bicubic Smoother, if you are increasing the size, or Bicubic Sharper, if you’re reducing size. We save the file unsharpened as some Image Libraries will require an unsharpened file and also because we will apply a different degree of sharpening when we either print or reduce the size of the file for web. 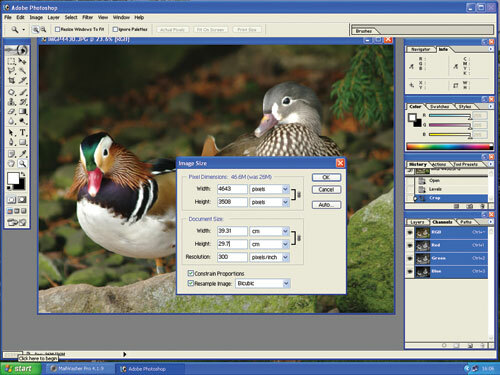 The image Size Dialog is used to alter size and resolution. This example is for an A3 print at 300ppi resolution. The Crop Tool The Crop tool is a very useful method if cropping and resizing in one go. It uses the same defaults that are set in the Image Size box. Click on the Crop tool and draw out a box in the image. This can be dragged to the shape and exact crop required. If you enter no figures in the top bar you just define your crop without resizing. 42cm in the first box, leave the second one blank and enter 300ppi in the resolution box. The reason for leaving the height blank is that the shape of the image can now be changed to fit. If a figure of 29.7cm was put in then the proportions would be fixed. picture on ePHOTOzine I would enter 1000px (pixels) as the width, leave box 2 blank and enter 72ppi as the resolution. Accept this by double clicking within the image or pressing the tick box. Then Save For Web enables the image size to be adjusted quite precisely before saving. These two simple approaches will enable reliable resizing and cropping of images for print or for web use. Next time we will look at adjusting brightness and contrast using the Levels option.